I met Bob in Ajo (Ah’-hoe) on a summer afternoon of 1999. Since Barb and I were cyclists, tandem cyclists to be precise, he caught my attention with his bicycle and two large trailers, so I picked his brain, as much as he would let me. What was he thinking? He hailed from North Carolina, as I recall. A TV documentary had piqued his interest in the American Southwest. Since he had no family to whom he had to answer he quit his job, purchased a Walmart bike, and then headed west. We didn’t discuss how he wintered. Obviously, he found somewhere to await warmer temperatures. 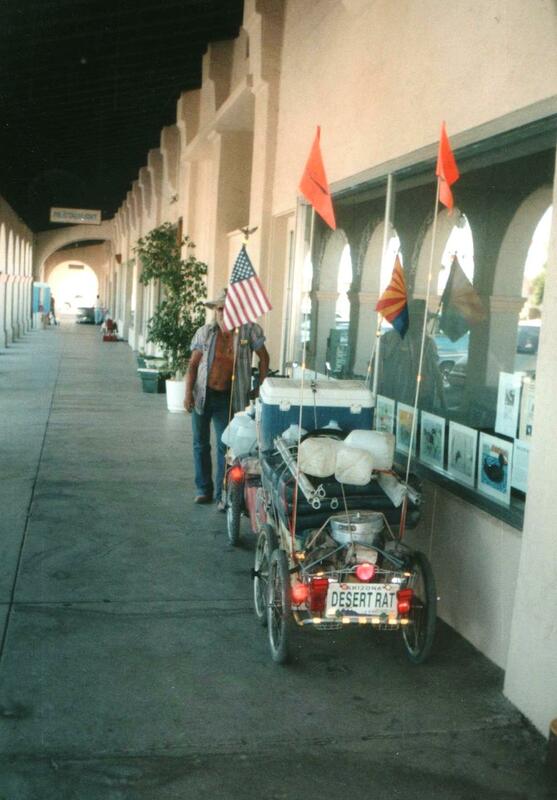 By the time he reached Teec Nos Pos in the Navajo Nation near Ship Rock a year had passed and he was a seasoned cyclist – enjoying the good, tolerating the bad. And he had learned to become nearly invisible, or would have remained so had he not decided a bicycle would not carry all the things he held dear. Therefore, he built a bike trailer from discards scavenged from an unattended landfill. I’m don’t recall what compelled him to build a second trailer. But both trailers were so heavily burdened he said he could no longer ride the bike except downhill. Instead, he pushed it. He told me he was road weary. His bike and two trailer had satisfied his yearn to see what lay over the next hill, or around the next turn. He no longer cared. He was now searching for a more conventional lifestyle. The last time I saw him he was managing a RV park at the western boundary outside the Tohona O’oham Indian Nation. He’d lost some of his crispy critter look, having taken shelter from the blazing Arizona sun. His bike and trailers were nowhere to be seen. met Bob in Ajo (Ah’-hoe) on a summer afternoon of 1999. Since Barb and I were cyclists, tandem cyclists to be precise, he caught my attention with his bicycle and two large trailers, so I picked his brain, as much as he would let me. What was he thinking?